The lander, known as Schiaparelli, slammed hard into the Red Planet on Oct. 19, apparently after its descent-slowing thrusters failed to fire for long enough, officials with the European Space Agency (ESA) have said. The new photos, which were taken Tuesday (Nov. 1) and released today (Nov. 3), show several bright spots near the main crater where Schiaparelli hit. These features were also visible in previous MRO images, though, at the time, it wasn't clear whether they were just "noise." But it's now apparent that the spots are real objects — probably fragments of Schiaparelli, ESA officials said. 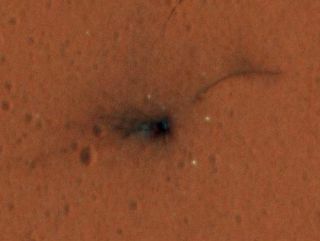 There are three distinct parts of the overall Schiaparelli crash site: the crater gouged out by the lander itself; the spot about 0.9 miles (1.4 kilometers) away where the parachute and its attached rear heat shield came down; and another feature that appears to be the spacecraft's front heat shield. MRO imaged these first two areas in color, but its new photos of the front heat shield are still in black and white. There should be more photos coming soon. "Further [MRO] imaging is planned in about two weeks, and it will be interesting to see if any further changes are noticed," ESA officials wrote in a statement today. "The images may provide more pieces of the puzzle as to what happened to Schiaparelli as it approached the Martian surface." An investigation into the events of Oct. 19 is ongoing, and could be wrapped up sometime this month, ESA officials have said. Schiaparelli launched with another spacecraft, called the Trace Gas Orbiter (TGO), in March. Together, the two probes make up the first part of the two-phase ExoMars program, which ESA leads with help from its chief partner, the Russian federal space agency, known as Roscosmos. The second part of ExoMars is a life-hunting rover, which is currently scheduled to launch in 2020 and land on the Red Planet in 2021. Schiaparelli's main goal was to prove out the technology needed to get this rover down safely; the data gathered during the descent on Oct. 19 should be useful for this future effort, ESA officials have said. TGO aced its orbit-insertion burn on Oct. 19 and is currently looping around the Red Planet along a highly elliptical path every four Earth days, just as planned. The spacecraft will make its first science observations at Mars during two orbits that begin Nov. 20, ESA officials said. Early next year, TGO will begin shifting to a circular orbit that lies 250 miles (400 km) above the Martian surface. The probe should reach this final orbit in March 2018, at which point it will begin its official two-year science mission. The chief goals of this mission involve hunting for methane and other gases that could be signs of Martian life. TGO will also serve to relay communications from the ExoMars 2020 rover and other surface Red Planet craft back to controllers here on Earth before ending operations in 2022.